Are you curious to know what day it is? It’s Ford Mustang day, of course! Our favorite pony car is now 50 years old, and marking the occasion are two incredible coastal events to keep all of us excited about the iconic Americana we have all enjoyed over the years. Las Vegas and Charlotte are the two hot spots holding a barrage of entertainment, ranging from open-track racing, cruise-ins, ride alongs, exhibits, burnouts, dinners, and even foot races. Wait, running? Nah, we’ll drive. Thanks, though. Even so, be sure to keep reading, below, to take a glance at the PR clippings which totally detail the schedule of events by day, by hour. This should keep you plenty busy, if you’re one of the fortunate ones to attend one of the events this Easter weekend. Question: Where does the 2015 Ford Mustang park? Answer: Pretty much wherever it wants. 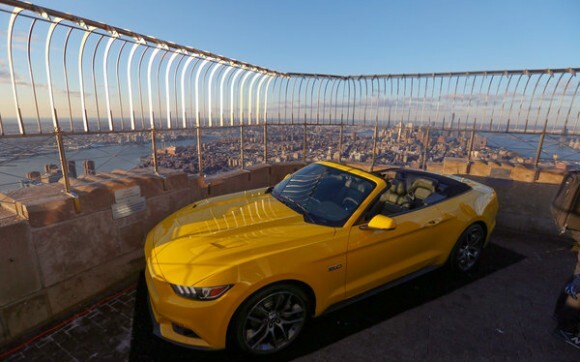 And in this case, on its 50th birthday, the Ford Mustang (once again) finds a cozy spot at the top of the Empire State building in New York City. Why? Because it can. Why not? No reason. Ford is pulling out all the stops for this celebration, and there should be no question as to why it’s all going down. From celebrations on BOTH American coastlines, to global social campaigns, every single fan…and maybe some new ones…will know that 50 years of an icon is simply awesome. Especially when it marks the fact that pride and joy endure the test of hardship over time. The Ford Mustang made it throughout 50 years. Here’s to many more to come! 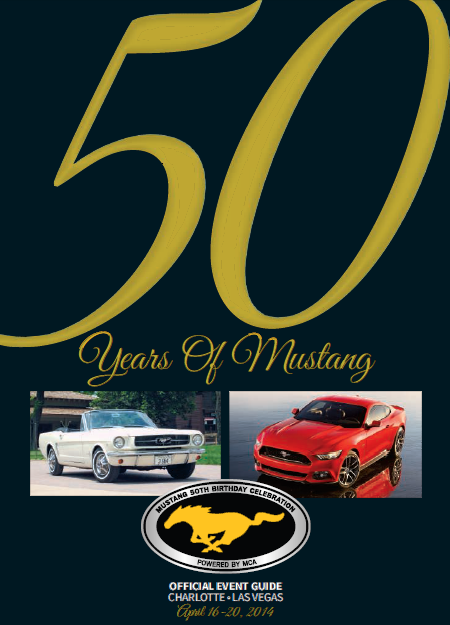 Anyone out there celebrating at the 50th Anniversary celebration of the Ford Mustang this weekend? Anyone in Charlotte, by chance? If so, I’d suggest you make your way to the festivities for many reasons, aside from the obvious, and make some milestone memories any enthusiast will treasure for a lifetime. 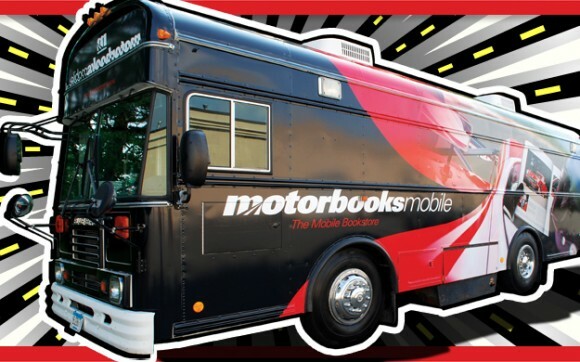 We just wanted to get out some quick news for you all, to let you know that there is a great chance you can pick up on some great book specials or just say “hi” at the least, to the Motorbooks crew, at their mobile gearhead bookstore. Keep reading to get more details on this one! Ready. Set. Now! That’s it. We are finally here, everyone. Ford’s on the brink of showing us just how big their plans are for the Ford Mustang 50th Anniversary, and everyone will be at the edge of their seats. Their first token of celebration–a throwback pony car, paying proper homage to the original 1964 Mustang which put all of this pomp & circumstance into position, for 50 years, and more to come. This special edition 2015 Ford Mustang GT fastback will be colored in one of two choices: Wimbledon White or Kona Blue. In addition to legacy hues of honor, the special edition 50th Anniversary Mustang will come standard with nearly every potential option in the books, and the only question remaining for a buy will be “automatic or manual?”. Not bad. 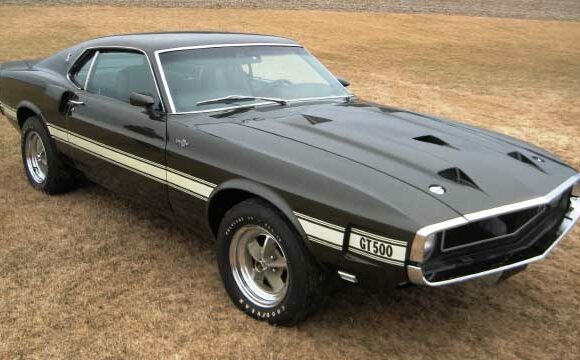 Anyway–this 1969 Shelby GT500 Mustang is definitely one for the record books, given the fact every single facet of its life has zero room for doubt. How’s that? Let’s try for Larry Brown’s original bill of sale, loan amortization, maintenance records galore, and the ultimate testament to his preservation methodology: plastic trash bags. Oh, and the classic “this thing never sees rain” theology applies here, too. All triteness aside, this Shelby GT500, with its sub-10,000 mileage, is for sure going to fetch an easy 6 figure auction price. Given the fact it’s made internet stardom in the past week or so only helps fuel the fire, too. 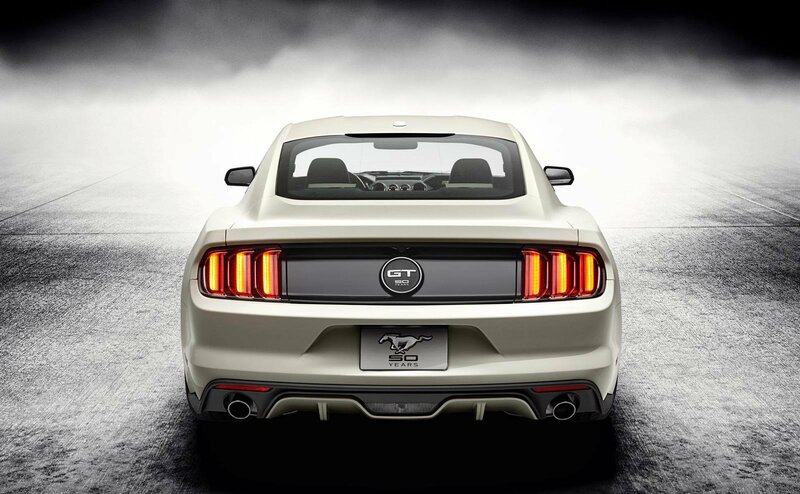 Here we are, Ford Mustang fans…it’s mid-March, and on the eve of the 50 year mark of our favorite pony car. The time is finally here, and we’re here to offer up some official intel to appropriately mark the occasion. Both seaboards of the States will serve as kick-off points, with Charlotte Motor Speedway and Las Vegas Speedway holding honors, respectively. When’s this action all get started? We’re glad you asked–just about 30 days from now–on April 16th, 2014. 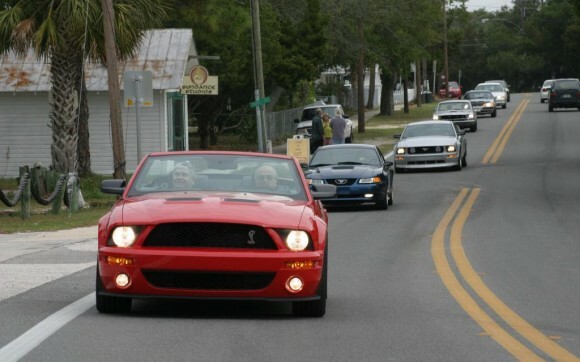 There isn’t much better than hitting the open road in a Ford Mustang. The only way, or maybe ways it could get better would be to join the ranks of an entire herd for the cruise…and to just happen upon a 50th Anniversary of the very car you’re driving. Sound like a cool adventure to take part in? It certainly does to us. That’s what is going down this spring, on April 13th, 2014, in Norman OK, where the Mustang Club of America (MCA) is holding host to a national cruise to chart the way to Charlotte Motor Speedway or Las Vegas Motor Speedway, depending. 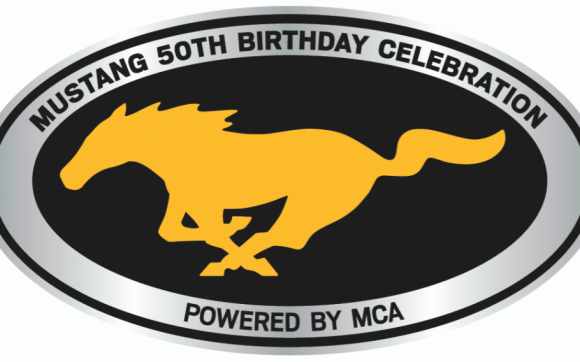 It might sound odd to have two destinations, but actually, it’s the most logical way to get the entire country involved from a centerpoint, expanding out to the coastal regions, where festivities will be held to continue the marking of the Mustang 50th Anniversary. Make no mistake, the 2015 Ford Mustang has already been making waves, and is sure to make many more as we continue to creep closer to the showroom debut of the car, and the exuberant test drives which are sure to come. 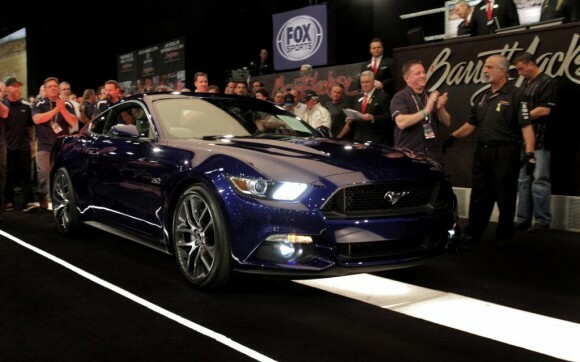 What’s interesting this last week in all things 2015 Mustang is that the very first production unit went up for auction at Barrett-Jackson, and brought in $300,000. Yikes. Really? Being the first one off the line, Ford had to make sure something special marked the occasion, and what better way than to slide the equivalent of some small nation’s GDP towards a charitable cause–the Juvenile Diabetes Research Foundation. It’s pretty cool when the past gets paid its due, and especially remarkable when it surrounds a half-century celebration of continuous production. At the 2014 North American International Auto Show, Ford has the all-new Ford Mustang, Ford F-150, and several other refreshed models for the upcoming showcase on display. 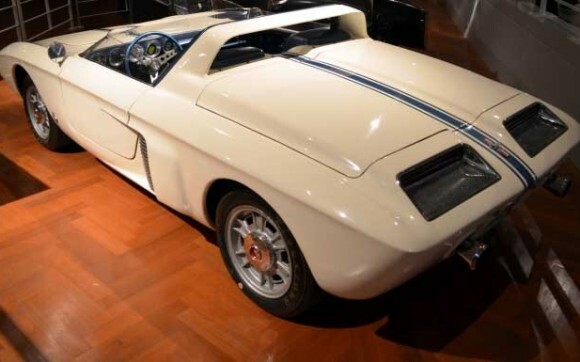 What could be quickly passed over at the show, however, is the 1962 Ford Mustang 1 concept–a mid-engined Mustang that never came to pass. What’s that? We don’t have to wait until March or April of next year to see the 2015 Mustang, or portions thereof? Color us happy! 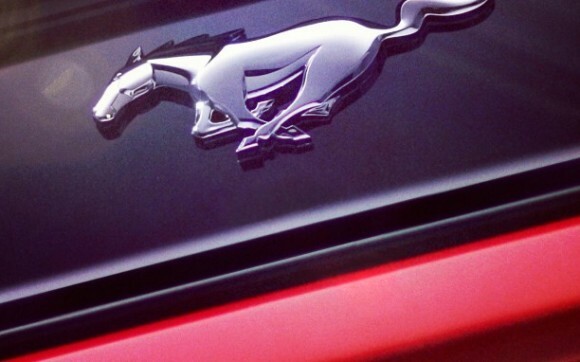 That’s right–official Ford intel points to the official 2015 Mustang debut being set for December 5, 2013…mere days away! Finally, everyone can put aside all of the total speculation, wishful renderings, and spy shots that don’t really show much more than a 5 year old’s crayon scribbles. So what’s this mean? 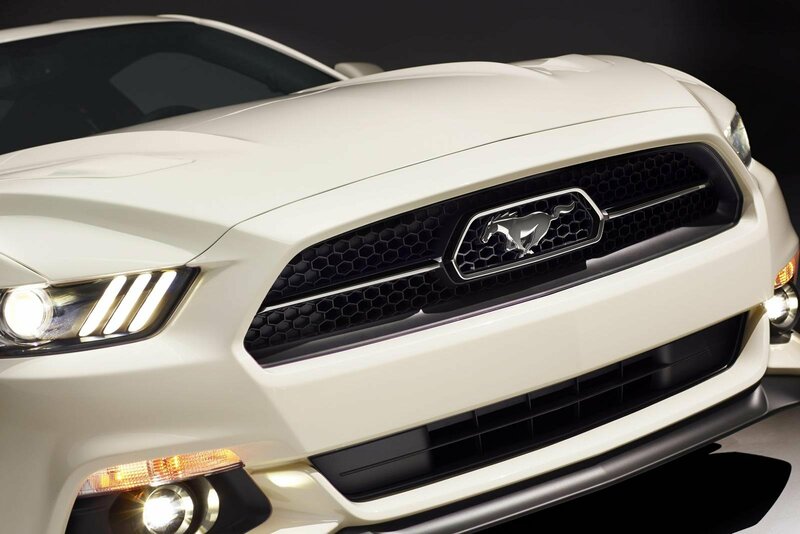 It means that Ford is jumping the gun a little bit, by not delaying to make the official 2015 Mustang reveal at the New York International Auto Show, where the first Mustang made its entry 50 years ago. 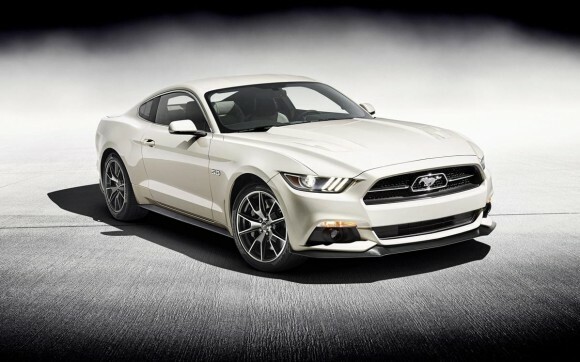 The unveiling of the 2015 Mustang is also set to take place on 6 cities in 4 continents on 5Dec2013 (further testament to the Mustang evolving to a global platform). And of course, the social media front will be completely lit with an official countdown, teasers, and suspense leading up to the official public announcement. Sit tight, everyone; it’s going to be a fun next two weeks!